For anyone who did not notice, I put up a bonus post on Wednesday night. Check it out--it features more J.Ho art as well as some non-J.Ho art! For those who don't care about He-Man (who are you people?) --please keep checking back--I have several pieces coming up that have nothing to do with He-Man, and at least two that don't even have anything to do with cartoons. Really! There was an issue with the line-spacing in my posts, where I was getting single-spacing and double-spacing at seemingly random intervals. I have fixed it, and conformed all posts to single-spacing. If you have a strong preference for double-spacing please let me know. This was kind of an odd one--I started with a really messy sketch, which was so heavy with blue pencil that i couldn't go over it with ink to tighten it. I was able to do a slightly-refined-but-still-very-messy ink sketch over that. I scanned that in, and tried inking it in Photoshop, but that was too clean compared to the other sketchy He-Man pics that I've been drawing. So I cleaned the scanned ink sketch a bit (but obviously retained a level of sketchyness to be consistent with my other drawings), and merged that with the "too clean" Photoshop "inks" to get the final line art. That whole process didn't take as long as I might have made it sound, maybe an hour or so. The coloring of Tri-Klops was basically uneventful. This pose is a little more dynamic than the others I've posted so far... still a bit awkward, but for the time it took me, I'm basically okay with it. As usual, I took a few liberties in depicting the costume details and colors. I merged the harness of his armor with his belt, because I felt that the design on the original toy was a bit redundant, and I made the green parts of his armor more olive, because I felt this matched the orange better. In a nod to the 200x design, I "covered" his neck. I also changed the colors of his sword, but I'm not sure how I feel about the result. 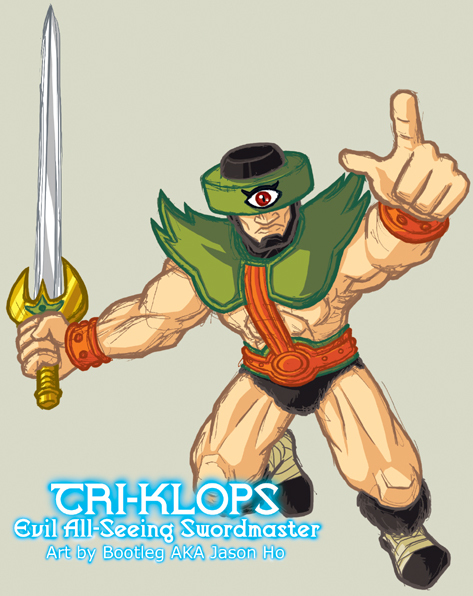 As for the title "Evil All-Seeing Swordmaster," well, I'm kind of freestyling there. The original tag for the action figure was "Evil and Sees Everything." Skeletor is a "Lord of Destruction," and Merman is an "Ocean Warlord"... all Tri-Klops gets is the same description that I would use to describe a nosy neighbor? Not very intimidating. So anyways, I tried combining what is known about the character to create a more menacing title, while trying to stay within the style of the original toys. As usual, this was posted on the He-Man.org fan-art forums. My post is here, the entire thread (including my Skeletor sketch) is here. Nice! He's one of my favorite minions along with Trap Jaw. I'm not quite sure what I lke about this guy, but I bet his real name is Inigo and his dad is probably dead. I like how you did this guys armor. But i don't like how he stares at me. Even if i move to the side...his eye....it follows! jamilyn: i was always more a fan of trap-jaw, but i'm glad you enjoyed this pic. i'm not sure i see the inigo montoya resemblance (except for the sword), but at the forums somebody did compare my version of seahawk to the dread pirate roberts. don chente: thanks man--i think tri-klops is sweet on ya!